12,338 healthcare conferences have registered their hashtag with Symplur to this date. From the many millions of tweets collected and analyzed we have gained deep understanding of the conversations taking place, KOLs present at certain conferences, physicians and patient participation, and ROI for sponsors of events. Incentivize your attendees to engage on social media and get a true understanding of your social performance. Arm yourself with evidence to attract sponsors. Get deep understanding of physician, patient, pharma, medical device company participation at your and your competitor’s conference. A 12-month access to Symplur Signals for your conference hashtag and up to 5 other competing conferences gives you an unprecedented ability to prove your comparative performance. 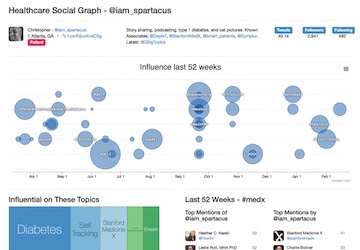 Access to the Healthcare Social Graph’s individual perspective will take your understanding specific users healthcare influence to the next level. The Healthcare Social Graph® is the vast neural network of healthcare conversations, content and people that gives life to Symplur Signals. As a Symplur Signals Enterprise customer you have access to three different perspectives into this graph. 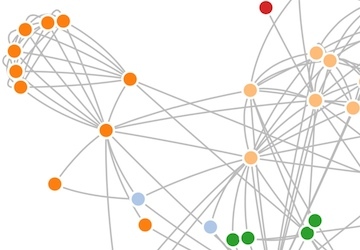 The individual perspective of the Healthcare Social Graph give users a quick snap shot of what healthcare topics, conferences, tweet chats and disease communities a Twitter user has been influential in during the last 5 years and with whom the user has engaged with. Arm yourself with evidence to attract sponsors. Get deep understanding of physician, patient, pharma, medical device company participation at your and up to 5 of your competitor’s conferences. Learn what best practices actually creates ROI. Discover your strengths and learn from other’s mistakes. With these insights you may perfect your next conference’s performance. Engage your conference audience. Provide a gamification of the social experience at your physical conference location by displaying real-time analytics focusing on the conversational tweets from your hashtag on your projectors and HD screens. Symplur Live is a real-time technology that aims to promote the right kind of conference tweet – the conversational tweets. A looping carousel of dynamic visuals will display the people central to the conversation, engagement analytics, trending topics and recent tweets on any screen. Only the last few hundred tweets are considered so that the analytics will constantly change from hour to hour and session to session. Symplur Live can also be embedded on a conference website. Several color themes are available. Symplur Signals promotes deep understanding of healthcare as seen by patients, doctors and other stakeholders with real-time access to your conference data. With a 1-month access to your conference hashtag you will be empowered with a complete understanding of the who, what, when, and why of your conference. To learn more about how your conference can take advantage of the services we offer, please drop us a line.